As the market evolves, Amazon is becoming a home for readers. Say what? “A home for readers?” The Evil Amazon? Did the jungle drums just miss a beat? There is so much for readers to do on Amazon – so much book-related content for them to peruse before buying. There it was again. I could swear I just heard a friendly word for Seattle. We have to ask ourselves, with the collapse of physical retail for books, which company will book suppliers want to deal with most? Just as iTunes supplanted record stores, Amazon is supplanting bookstores. Of all the bookselling options out there, only the remaining indie bookstores and B&N are more “bookish.” Should they eventually collapse (or transform or get sold), Amazon will be the most bookish place for readers to go to buy books. You’re not hearing from some Prime-drunk refugee of the Borders wars here. These are the thoughts of Laura Dawson, Firebrand’s reigning Queen of Metadata, one of our best-regarded publishing specialists, and she’s packing knitting needles, don’t cross her. 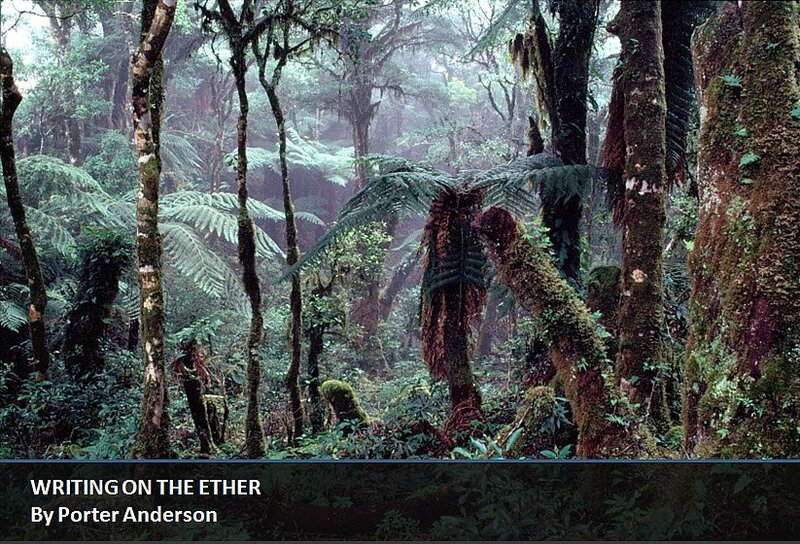 In Why Amazon Will Be the Good Guy, Dawson is echoing a jazzy new counterpoint to the shrill call of the poison-dart frog we’ve heard so relentlessly in deepest, darkest Amazonia. In the late 1990s, the American Booksellers Association sued Barnes & Noble and Borders over what they felt were unfair trade practices… B&N was the king of the discount. And for “bookish” folks, this was a source of friction – the cheapening of books made them seem commoditized, and our beloved independent bookstores were going out of business. Hunker with me here. This is an argument many can’t see yet. Amazon has been regarded as less than entirely “bookish” since its inception, when Bezos made it clear that books were just the beginning (and only because books were the easiest products to build a store around). There may be a pretty practical truth to that line. What do you think? Keep listening. There’s more than one line of thinking being updated on Amazon at the moment. You hear it between the blind hate-Amazon monkey chatter and the reluctant growls of slow-moving traditionalists. The nightmare narrative being spun by the publishing echo chamber is tragically unaware of how Amazon works. Maybe it’s because publishers imagine that Amazon will do what they would do if they had Amazon’s market power. Amazon won’t extort huge sums of money from powerless consumers. Instead, they will ruthlessly bring efficiency to every process involved in publishing. And then they’ll invite everyone to use their ruthlessly efficient services. What Hellman is saying is that the the real profit centers for Seattle lie in scale-enabling systems, the formidable tidal powers such as Amazon Web Services, which ebb and flow according to supply and demand. He has climbed way up to get a much airier view of Amazon’s corporate basin than most of us book-grubbing ground-dwellers have done. A beta site dedicated to selling office equipment and industrial supplies to businesses. Amazon Supply offers more than 500,000 products, according to the company, including hose clamps, roller chain sprockets, drill bits, sheet aluminum, brass and other items. The site grew out of Small Parts, a supplier of equipment for science labs, Amazon bought in 2005. How are we going to keep them down in Seattle, now that they’ve seen the Micro Essential Lab 94 Hydrion Spectral Insta-Chek Wide Range pH Test Paper Dispenser, 1 – 14 pH, Single Roll? Stomping around our small clearing called publishing really may not be this giant’s greatest ambition. And one of our very best heads, Brian O’Leary is also leading the porters and this Porter toward “Dr. Hellman, I presume,” In A More Likely View. Hellman’s work is always worth a full read, and I encourage you to take some time with his post. This is the reason publishers can’t beat Amazon: they aren’t even playing the same game. pH Test Paper Dispensers, remember. If Amazon is all about scale, what are we about? Needless to say, there are disagreements on the forest floor. In Aftermath — notes on the Amazon post, another fine observer of the realm, Baldur Bjarnason, weighs in with serious qualms. They don’t necessarily go head-to-head with Hellman’s conceptualization. But they indicate a mistrust of Seattle’s model. Amazon is taking risks everywhere. They are treating their suppliers, publishers, badly, essentially behaving like monopolists before they have an actual monopoly. Their share price is massively overvalued by any measure. The more they rely on their private ebook format for some sort of lock-in, the more they cut themselves off a growing ecosystem of ebook production and development tools, which requires them to make their own development tools, which further drives down their margins. I’ve heard time and time again recently that Amazon is all about scale, and it is this that will kill off publishers… But I am not sure publishing books is scalable, or will be greatly impacted by it: at least not on the creative side. At its heart, this case is about protecting competition, not competitors. And most importantly, it is about lower ebook prices for consumers. 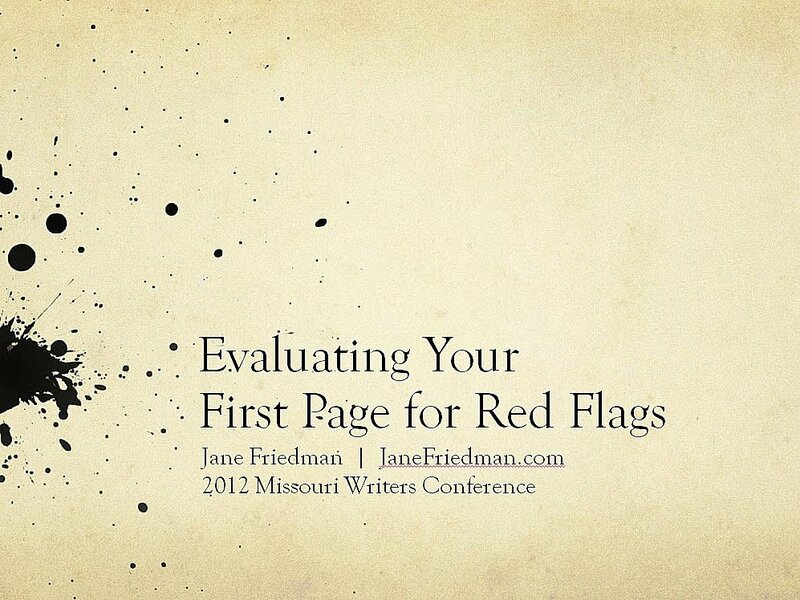 From Jane Friedman's presentation on first-page red flags at the Missouri Writers' Guild Conference. The series of handsome ecru slides you see in this edition of the gas are from Ether-eal host Jane Friedman’s deck for her recent presentation at the Missouri Writers’ Guild Conference. Friedman spoke, as did another sister in the Ether, Christina Katz. In keeping with a back-to-basics trend you might pick up on in the writing/craft sections of the Ether, Friedman’s approach is an excellent examination of what to do — and what to avoid — on a manuscript’s first page. And if you ever wonder why writers can seem so crazed about the difficulty of their primary task (that would be writing, Yuvi Zalkow will remind us a bit later), consider that all the points on these slides are meant to go into a marvelous Page One so that the reader does what? — blows right through it and turns eagerly to Page Two. Where the battle is fought again. Jane’s the one in the flak jacket. Here is her complete slide deck.